Okay, so because of my ever busy work/school/life schedule, the wife and I have been talking about her gaming with me again. A long time ago, she was the proud owner of a very large Dark Angels army that only ever saw the light of day on the garage gaming tables. Needless to say, after the store, that army went away, but here we are again, talking of resurrecting a Dark Angels army for her. 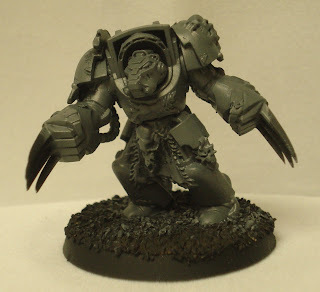 Putting together a Deathwing/Ravenwing Strike Force list was pretty fun, and it will have very little in the way of model count, but will be bike/landspeeder/terminator heavy. To get the painting juices flowing on the army, I through together a little painting walk through for the Guardians of the Covenant Dark Angels Successor Chapter. Looking forward to Rich Van Meter's update. He is using my walk through for space wolves to lay down his base coats and will be bumping his models to level 2/3 soon! Here are just a few of my hints for being an effective speed painter. Keep a simple, restricted pallet. My normal pallet of colors per color scheme will be 4-5 colors, not including washes. Keep multiple water jugs handy. I use 3 - one for dark colors, one for light colors, and one for metallics. Use multiple brushes - Again, same as above. 1 set for dark, light and metallics. Accelerate drying times - invest in a little high velocity fan. After each base coat or wash, position the fan about 8 inches from drying models and then flip it on. Speeds up paint drying times by about 50%. Get and use a tank brush or equivalent - GW stopped making them, but there are regular art store brushes that are the equivalents. This one here is a favorite of mine. Its a flat, making painting large areas easy and smooth, and with the narrowness, makes it easy to base coat rank and file. Know your paints! - Know which washes shade what colors and what colors highlight them. By grouping these colors together, you can base 2-4 colors and then wash them all at once. Heavy pigment - Heavy pigment paints are best, and allow for cleaner coverage. P3 makes a really nice range of paints and they are heavy pigment, just steer clear of their metallics unless you like really heavy flake. Always prepare a test model. - Always assemble an extra model or two just to get a feel for the paint scheme to make sure it is looking the way you want it to. Just remember, speed painting is a technique and may not work for everyone. It is also a very nice base for more advanced techniques like highlighting, etc. These are just a few tips to help all of us out there get more painting in so we are fielding painted units faster! Hey Rich, here is that step by step you asked for. Step 2 - Base with Grey. In this case, P3 Ironhull Grey. AS I am using a Preheresay color scheme, and these terminators are joining the army. Step 3 - Paint on all metallics. I used GW Boltgun on the worky bitz, and VGC BRassy Brass on all the ornamental bits. For the Crux Terminatus, I used Codex grey.....This is suppoed to have parts of the Emperors armor and his stuff WAS NOT BONE COLORED! (lols). Once all of this is dry, wash the entire model in GW Badab Black. Step 4 - Add Bestial Brown to all wolf pelts/tails, followed by a light drybrush of bone. I use P3 Jack Bone, but GW Bleached works fine. Another fine dry brush of GW Skull white towards the ends of the pelts/tails. Paint all Tooth trophies, mini wolf skulls, etc with Bleached Bone. Wash those areas with GW Gryphonne Sepia. 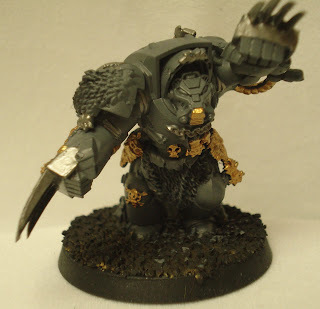 For my paint scheme, I use black backgrounds, so I blacked out a kneepad and shoulder pad background with GW Chaos Black. Added GW Iyanden Darksun stripe to kneepad and a platte on the helm. The finished product. Basing will be GW Skorched Brown, washed with GW Devlan Mud, with a light GW Skorched Brown drybrush. followed up with spots of static grass, and Happy McSlicy hands here is ready for play. Total time for paint (without counting drying sessions) 15 minutes. Or at least I had thought I was running 2250, until I returned home, finding I was 250 points short! DJs IG army was pretty well appointed and put together, plus they looked good. This is going based on my recollection of the game, so it may not be entirely accurate, by hey, close enough for a good read. Using Orders, he poured tons of Las fire into my Grey Hunters and dropped both units, taking 1 to 1/2 strength, the other completely slaughtered. DJ - Demolisher in on reserves, came in short side next to end of IG fire line. Vet Squad with meltaguns Pen 6 LRC, remaining Vet Squads pour Plasma fire in, killing 3 BCs. LR 1 destroyed Rhino #1 - LR #2 Destroyed RB, misc las fire killed 2/5 of the WG termies. Las fire continued killing GH squad to a man, and then some lasfire into the WG squad, killing 2. Assaulted Scouts with a IG squad, was beaten and ran down. Mike - Lord and WG squad, WG termies move forward to engage in assault. BC squad moves and loses 6 models in Dangerous terrain rolls for leaving the crater of the LR. Scouts Melta blast LR#2 - can't move or shoot. Assault phase - Lord and 3 remaining WG squad assault 2 units of IG, wiping out 2 more squads, but losing another WG. Termies hit 1 other squad, breaking them from combat res. Consolidate into cover by the Drop pod. Scouts assault damaged LR with meltabombs, pen 5, destroyed. BC assault Vet squads, killing one more IG squad, but losing all but 3 remaining BCs. Mike - All that remains - 1 Lord, 1 WG, 1 Scout. Move Lord and Guard into combat against CMD HQ - Scout moves to target Demolisher with Meltagun. Melta fire hit but failed to even glance the Demo at max range. Lord and WG kill all but Creed in combat, and lived to tell the tale against a real bad batch of rolling. DJ - Pour fire into the remaining wolves, but I made some great rolls for saves. Killed remaining Scout with las fire. Game ended with victory to DJ. His army is really well balanced and if I had not committed my Grey Hunters before I had the rest of the army to back them up I could have pulled this off, even with playing 250 points down. 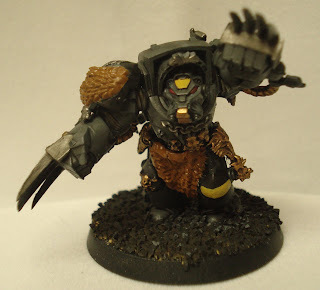 I may drop 2 Wolf Guard Terminators in favor of a Rune Priest in Terminator armor. The psychic phase may actually keep the termies alive long enough to actually do something. 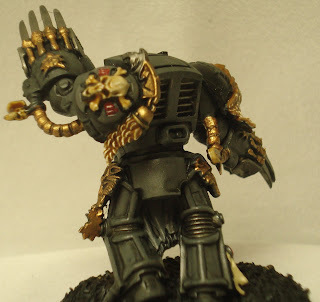 Okay, so putting together my total list and the total spent for my Space Wolves Army. Of course this is all Dave's fault, but hey, I welcome the distractions. Priming up some stuff tonight, but I have a paper due on Sunday so the nest few nights will be little or no painting, unless I squeeze some in during the day. 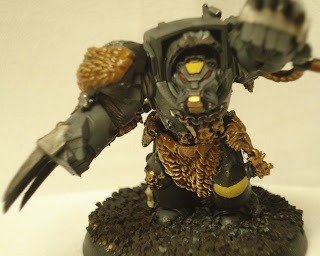 Space Wolf Step by step coming soon too. Okay so I am on vaction this week. I decided to try getting some "other" models painted in taking a break between corpse carts. So this year has started out with a bang already. Got a good 8 hours of gaming in last Saturday. Got to show off my fantastic Ork army. And I even got to play 2 games of WFB! I knocked the dust off Cass's old dwarfs (think 5th Ed models) and was able to play few games with them. Got the repaint all planned and test model finished. On vacation from work this week, new class starting later today, and thought it would be good to finish off a few models! Finished off the last vargulf for Bill, and got a Corpse Cart done. Let me tell you, I like the model. It is interesting to say the least. Pretty straight forward. Lots of various dead and rotting flesh, a few rats, and a pile of burning skulls.Will finish the other one up tomorrow night after I get done with the required classwork. Will also get some pics of my finished SW Scouts and my 1st unit of GH and Rhino i finished off for them.